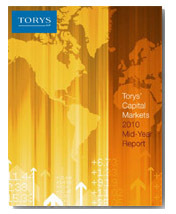 Torys is pleased to announce the release of our Capital Markets 2010 Mid-Year Report. Members of our Corporate and Capital Markets Practice have provided analysis of the current state of capital markets in Canada. The year 2010 promises to be challenging for issuers, investors and their advisers. Notwithstanding the market's concerns, economic activity in North America has picked up, and consumer confidence is on the rise. If those factors continue through the remainder of 2010, it is likely that Canadian capital markets will remain open to quality issuers with a good reason to raise debt or equity financing. To download a copy of Torys' Capital Markets 2010 Mid-Year Report in PDF format, click here, or click on the article titles below.